On episode 31 of Sourcing Matters we welcome Ryland Engelhart and Jesse Smith of Kiss The Ground. 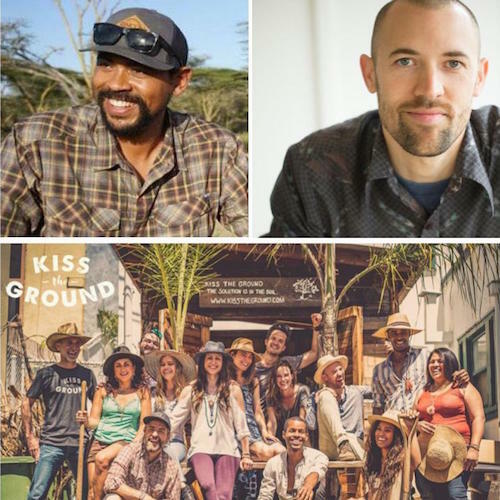 Well known for the critically acclaimed book and forthcoming movie, both sharing the same namesake as their organization, non-profit Kiss The Ground is telling a new story about our ability to regenerate land, reverse climate change and reconnect to nature by building back healthy soil. Through programs focused on storytelling, education, business, community gardens and the farmland – Kiss The Ground empowers people to restore soil and help accelerate the adoption of regenerative agriculture. Seamlessly complementing each other throughout the 45 minute conversation, both guests brought unique insight to our discussion which connected soil, human, and planetary health. Ryland Engelhart currently serves as the Mission Fulfillment Officer and co-owner of Cafe Gratitude and Gracias Madre. Engelhart co-founder of Kiss The Ground, and now works tirelessly to educate and advocate about the movement. As a storyteller, Ryland co-created the award-winning, transformational documentary film, “May I Be Frank.” Also, he’s an entrepreneur and activist, using his restaurants as a platform to inspire more “gratitude” into our culture. Running the Kiss The Ground Farmland program, Jesse Smith adds unique acumen from the perspective of a producer and philosopher. Smith is a farmer, designer and consultant focused on the intersection of regenerative supply and enterprise. His passion for agriculture and food systems is rooted in his love of California’s diverse ecosystems, and influenced by his work and travels through Africa, Europe and the western United States. Jessie’s family, friends and community are what inspire him to develop a network of farmers, restaurants and consumers to benefit our soil, water & air. In this episode we go deep into the problems, and potential solutions for a shrinking planet. Ryland describes the impetus for formulating this unique arena of Kiss The Ground which seems set on democratizing complex subjects that will prove increasingly essential for stabilizing all corners of the world. Engaging consumers and citizens as the agents of change, it was consensus amongst all of us that it has to be the grass-roots to lead us forward through this tumultuous and concerning time for the future health of our planet. The people will lead, and the policy will (eventually) follow. Through the collection of their farms, non-profit initiative and restaurants this west coast collaborative is drafting a new recipe for moving us forward. A mechanism that vertically integrates the value chain which will benefit the consumer of their food, fiber and fuel, and lead to positive externalities of regenerative results.